St. Vincent de Paul and St. Louise de Marillac founded the Daughters of Charity in France on the eve of St. Andrew’s feast – November 29, 1633 – with the help of twelve dedicated peasant girls. Social and economic status was not the only difference between these Daughters of Charity and their predecessors. They bound themselves to God by simple vows. Early in their history, the practice of annual vows, as opposed to perpetual vows, was established. St. Vincent de Paul was born in Pouy, a village of France, on April 24, 1581. He embraced the clerical life in December of 1596, and was ordained a priest on September 23, 1600. St. Vincent is acclaimed for his genius in organizing. In fact, he organized both the Congregation of the Mission and the Daughters of Charity. Both continue to flourish today in many countries, under the direction of the Superior General of the Congregation of the Mission. St. Vincent de Paul died on September 27, 1660. St. Louise de Marillac was born on August 12, 1591 and married Antoine Le Gras on February 5, 1613. Her only child, a son, was born in 1614. St. Louise’s husband died December 21, 1625. She started making tours for Confraternities of Charity for St. Vincent de Paul on May 6, 1629. On these tours, she gave talks on home nursing, preparation of food and precautions against the spread of contagion. St. Louise became Sister Superior of twelve peasant girls on November 29, 1633 – one of whom was the revered Marguerite Naseau of Sureness. St. Louise was but a poor country girl, and may be said to have had hardly any teacher but God. She is described as “servant of children in their homes; servant of the poor, the sick, and plague stricken; in turn teacher and hospital nurse; obedient, generous, loving and finally a victim to her devotion to the unfortunate.” God, who puts the mighty oak in the humble acorn, put the Sister of Charity whole and entire in this lowly ancestry of the Company. St. Louise de Marillac died on March 15, 1660 after several years of illness. The motto of the Daughters of Charity is this: The Charity of Christ urges us. On the Rue du Bac in Paris lies the motherhouse of the Daughters of Charity. It is the headquarters for forty-five thousand women dedicated to the ideals of God, St. Vincent de Paul and St. Louise de Marillac. Their work extends to the entire world. No form of Christian charity is foreign to their zeal. You will find them in hospitals, schools, leprosaria, orphanages, hostels for the refugees from Communist dominated lands; in settlement houses, homes for unwed mothers and nursing the sick in their homes. In fact, wherever one wished to meet the poor, face-to-face, there you will find the Daughters of Charity. Elizabeth Ann Seton was born in New York City on August 28, 1774, of an influential and cultured family. Her father was Dr. Richard Bayley, a noted lecturer at King’s College (now Columbia University). He was the first health officer and was responsible for the first quarantine station. Her mother was also of a well-known family – she was Catherine Charlton, daughter of the Rector of St. Andrew’s Episcopal Church in Staten Island. After her education in a private school in New York, Elizabeth Ann became a prominent figure in New York society. She was beautiful, charming and of a deeply religious spirit. At 19, she married William Magee Seton, the son of a wealthy merchant. Five children were born to this happy couple. However, in a few short years, this family was to experience business misfortune and ill health. William Seton died in Leghorn, Italy in 1803, after a sea voyage was undertaken in vain in an attempt to restore his health. The Filicchi family of Leghorn took the widow and her children into their home and showed her every kindness. This was a truly genuine Catholic household. Elizabeth was very impressed by all she saw. In March of 1805, Elizabeth was received into the Catholic Faith at St. Peter’s Church on Barclay Street in New York. Elizabeth made known to Archbishop Carroll her intense longing to consecrate herself to God in the professed religious life and was allowed to pronounce her vows. By 1809, Mother Seton had opened two schools – an academy for girls and a tuition-free school adapted to the needs of the poor in Emmitsburg, Maryland. This latter establishment was the forerunner of the Catholic Parochial School System in the United States. 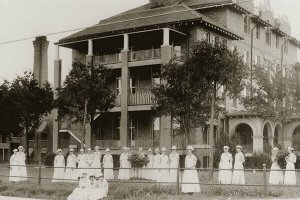 Poverty, hardship and exhausting labor marked the early days of Mother Seton’s Community. Death took two of her own daughters and two cherished sisters-in-law who had followed Elizabeth in her work. Throughout those years of trial, Elizabeth’s courage, patience and fortitude were upheld by heroic spirit of faith, hope, and charity. Her own death came on January 4, 1821. She died in poverty, but rich in faith and good works. The foundress of the Daughters of Charity in America, Mother Elizabeth Ann Bayley Seton, was canonized in Rome on September 14, 1975. It was from Mother Seton’s Community in Emmitsburg, Maryland, that three young, courageous Daughters of Charity left for Waco, Texas, on November 29, 1904, to begin what we know today as Ascension Providence.